I would love to see your Sweet Tweet Spring Centers be your freebie! So excited about this event!! Thank you for sharing your great centers!! What a great freebie! Thanks so much for sharing! Have a great Teacher Appreciation week! Thanks so much for sharing your free item in the Jackpot!! Unfortunately, I missed signing up... but you can still pick up my free item HERE! Thanks so much for sharing! As a fourth grade teacher who teaches 1st grade summer school, you just made my life so much easier! Thank you so much! YOU are appreciated, too! Thank you so much. Super cute freebie. 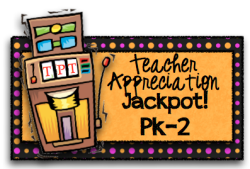 We are your newest blog and TpT followers thanks to this awesome Jackpot! Cutest blog award! I am so glad to be following you, and thankful for your fabulous freebie! I hope you enjoy mine too! So glad I found your blog today. Thanks for the freebie! Thanks so much for participating. I love it! Love the clipart on this product! It's the same one I used on my blog design! : ) I'm a new follower!